Preferred Habitat: Urban and rural areas. Seasonal Occurrence: Permanent resident. Abundant throughout the year. Profile by Vicki Stittleburg: The Great-tailed Grackle is North America's largest grackle. Males have an all black body with bluish purple iridescence, a long, tapered tail that folds into a distinctive keel shape, yellow eyes, long black legs and a black stout bill. Females are about half the size of males; they have a grayish brown body, a buff-colored throat, yellow eyes, a lighter eyebrow and a shorter tail. Juveniles have the female’s dark brown plumage, with streaked underparts and a dark eye. In 1900, the northern edge of the Great-tailed Grackle’s range barely reached southern Texas. Since the 1960s they’ve followed the spread of irrigated agriculture and urban development into the Great Plains and West, and today are one of North America’s fastest-expanding species. Great-tailed Grackles are a permanent sight in Houston and can be found in any area inhabited by humans that has some trees. They tend to congregate in large flocks and prefer shopping centers and fast-food store parking lots where there's trash for food and trees or light posts for perching. 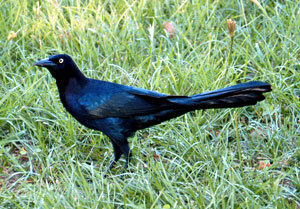 Great-tailed Grackles have a wide repertory of songs and sounds including piercing whistles and creaks. In the evening, raucous flocks pack neighborhood trees creating noisy roosting aggregations.